Torrington came together in the final quarter for a win over St. Paul at Torrington High School Thursday night. 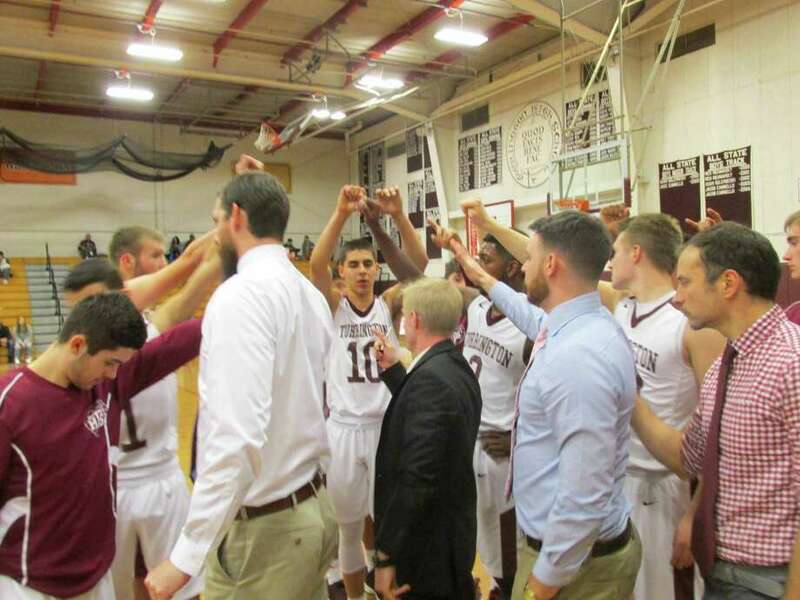 TORRINGTON – Torrington’s boys basketball team pulled away in the final period to a 75-62 win over St. Paul in a game that was deadlocked for three quarters at Torrington High School Thursday night. Junior forward Noah Waters led the Falcons with five of his six three-pointers for all but three of his game-high 29 points before the game’s final run for a 19-16 St. Paul lead at the end of the first period, 33-32 at the half and 54-54 at the end of three. Will Burton, Jack Noli, Joe Leone and Tyler Garry chipped in six more treys for a 12-three total that had the Red Raiders scrambling. “We were a collection of individuals,” said Torrington coach Eric Gamari. “We don’t always depend on the threes, but our other players weren’t getting loose inside the way we wanted them to,” said St. Paul coach Steve Phelps, whose Falcons (7-8; 6-7 NVL) held Sacred Heart to a 50-42 win at the beginning of the year. But, if the Falcons were largely restricted to the outside for the first three quarters, nobody got loose in the fourth. That meant eight steals for the period, all of them sending the Red Raiders off to the races where their best game is on the run. Ironically, St. Paul’s Donovan Symes scored the period’s first points on a fast break. Waters got loose for one more three. Otherwise, the Raiders literally ran off a 21-8 blue streak. Dontae Thomas led the charge for Torrington (10-4; 9-3 NVL) with 23 points, including 7-for-8 from the foul line. Joel Villanueva had 20, including three of Torrington’s six three-pointers. Tyreek Davis had 17. C.J. Root had just two points, but epitomized Torrington’s fourth-quarter effort with a steal that sent him to the floor. Sitting with the ball, he passed ahead to Thomas for another fast break. Torrington’s Kevin Dixon was back on the floor for the Raiders after a month’s absence. St. Paul’s Garry, who didn’t play in the teams’ first matchup, is back in the Falcon lineup after recovering from a pre-season broken wrist. With their added depth, the Falcons have won three of their last four games. Connor Quentin 1-1-3; Will Barton 1-0-3; A.J. Brooks 1-0-2; Noah Waters 11-1-29; Christian Peterson 1-0-2; Donovan Symes 3-0-6; Tyler Garrry 2-0-6; Jack Noli 2-0-5; Joe Leone 2-0-6; Totals: 24-2-62. Dontae Thomas 7-7-23; Nick Balducci 7-3-17; Joel Villanueva 6-5-20; C.J. Root 1-0-2; Zac McLaughlin 1-0-2; Kevin Dixon 2-0-4; Totals: 26-17-75. 3-point goals: SP – Baron; Waters 6; Garry 2; Noli; Leone 2. T – Thomas 2; Balducci; Villanueva 3. Records: St. Paul Catholic 7-8; 6-7 NVL. Torrington 10-4; 9-3 NVL.